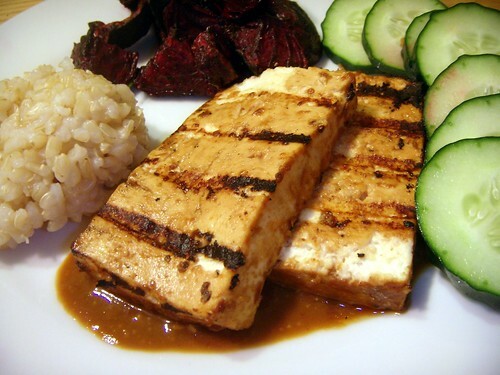 miso grilled tofu with roasted beets and short-grain brown rice, originally uploaded by aarn! +2nd March, 2009+. made a marinade with 1-2T. of sweet white miso paste, a pinch of salt and pepper, some grated ginger and garlic, and a splash of soy sauce, braggs, fish sauce, lemon juice, and agave nectar, to taste. the consistency was thin, but still clingy. tossed some half inch thick slabs of tofu in the mixture for 30-min or so, flipping occasionally, then tossed them on a hot grill which had been wiped with oil, until some color developed and the tofu started to develop a slight crust. beets were peeled, quartered and tossed in some olive oil, salt, pepper, and fresh thyme, then placed on a baking sheet in a 425-degree oven until crisp on the outside, turning as necessary. tofu was served over a drizzle of the miso marinade with the roasted beets, a scoop of crunchy short-grain brown rice, some sliced cucumbers and the spicy dry ground carrot and celery salad (not pictured).